What Is Wrong With This Steamer? Having failed so miserably to identify the seventeen errors in What Is Wrong In This Room?, I need to try again, if only for my self-esteem. So here goes, another puzzle from my 1927 copy of Arthur Mee’s Children’s Encyclopedia: What Is Wrong With This Steamer? I am going to cruise through this because I know all about ships. I’ve got nautical blood. My great-grandpa was a master mariner and my dad used to take me to watch tide-time at Goole docks. We had books about ships, used to play with toy ships and went to see the Queen Mary sail. I’ve been on the cross channel ferry, sailed a model yacht across the West Park pond and circumnavigated Peasholm Park lake in a swan pedalo. My wife’s grandfather wrote books about sailing. It’s going to be a sea-breeze. I’m on course for a fleet of ten out of ten. So, full steam ahead Captain, all hands on deck, let’s cast off and get under way. Just look at those Roman numerals on the bow. They are supposed to show how deep the ship is floating in the water so should obviously run from bottom to top. And while we’re looking at the bow, where is the ship’s name? As for those rope ladders up the mast, they have no rungs at the top. Easy! We’ve logged 3/3, a fair rate of knots. Is this the calm before the storm? Sailing close to the wind, I sneak a look at the answers. I must have had only one oar in the water not to realise that portholes open inwards, not outwards, as should that square shaped hatch. Evidently it’s a scupper for draining water from the deck. That scuppered me. But is the marking scheme above board to tally these as two answers? If so, it’s only 3/5 now. We’re into deep water. We’ll batten down the hatch and press on, but I can’t fathom out any more. The answers say that the foremast and funnels should lean backwards rather than forwards. Oh come on! You can hardly tell. It might help if the drawing was shipshape. And does it fit the bill to score these as yet another two. I’m all at sea with 3/7. The next ones leave us becalmed in the doldrums. 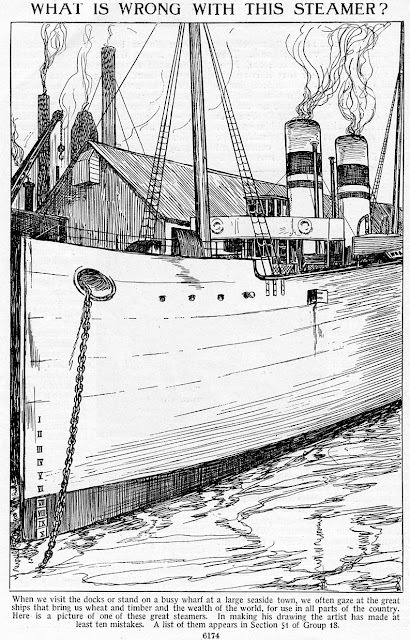 The waste steam pipes should be in front of the funnels rather than at the sides – I didn’t even realise what they were – and you would really need to know the ropes to realise that ships do not lower their anchors in dock. The answers then say that the anchor-chain hole is the wrong way: presumably it should be more vertical than horizontal. All right, I didn’t spot these, but ahoy Arthur Mee, matey, don’t you know that an “anchor-chain hole” is correctly called a hawsehole? I’ll hazard that every nineteen-twenties child would have known that. I should get extra credit, even if I only remembered it because it sounds rude. I’m sunk with 3/10. But what’s this – an eleventh answer, or is it thirteen? It said there were only ten. There are no ventilators (those sticking up tuba shaped things you see on ships). Nor are there any halyards or foretop-mast stays. No what? I’ve had to google those. It’s beginning to sound like a verse from What Shall We Do With A Drunken Sailor. Well, I’m pooped. Shiver my timbers. That’s taken the wind out of my sails. But if Arthur Mee is going to take us aback with supernumerary answers, then I should get my extra hawsehole mark, so 4/11, or 36%. In my university days that would have been a refer grade. I demand another re-sit, to start again with a clean slate. I’m up in the crow’s nest on look out for another puzzle. Lee is a master of metaphor and simile. They come so thick and fast on every page, so astonishing in their aptness and originality, it is impossible to pick any one example above another, but here are some from google search. One could never begin to emulate him. 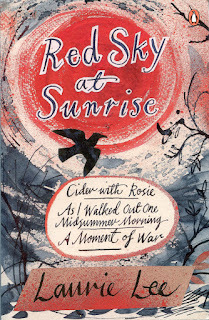 Cider With Rosie is a recollection of his Cotswold childhood in Slad, near Stroud, Gloucestershire during the nineteen-teens and -twenties. As I Walked Out ... tells of leaving home to work in London, and then travelling around Spain in the nineteen thirties. A Moment of War is an account of his experiences on returning to Spain to fight in the Civil War, a period he was lucky to survive. Cider With Rosie is the most lyrical and impressionistic of the three. The others pull you along with a much stronger narrative. Came to a lady’s door. You never shall want any more. When he got to “come in, come in”, he pretended to pull me towards him, malevolently, like a monster or one of those evil deviants we never used to mention. He would never tell me what it was. Some years ago I looked for the song on the internet and found nothing. Looking again now, there is still very little. The story it tells seems to have been related to an old English and American ballad called The Soldier’s Poor Little Boy or The Poor Little Sailor Boy. Recordings include a 1927 version by the Johnson Brothers, one from the Max Hunter Folk Collection sung by Reba Dearmore in 1969 and a 1922 recording by C. K. Tillett. In at least one version, the lady takes the boy in because her own son has been killed in battle. In others the boy turns out to be the lady’s long lost son “William that’s come from the sea”. There were more verses with several variations, but my dad only sang the words above. There are also possible references to the Poor Little Sailor Boy title in nineteenth century newspapers. The earliest I found was in the Norfolk Chronicle or Norwich Gazette of 25th July, 1807. If that does not seem particularly old, we should bear in mind that many of what we think of as ancient Christmas carols were written as recently as the eighteenth and nineteenth centuries. The tune for Haley Paley, however, is quite different to The Poor Soldier/Sailor Boy. The Yorkshire Garland Group (an archive of Yorkshire folk song heritage) has a seven-verse version in 6/8 time, which appeared on a 1971 LP Transpennine, performed briskly by Harry Boardman and Dave Hillery (unfortunately, the YouTube links to the individual tracks are now blocked). The site also refers to a shorter variation called Early Pearly sung in slower 3/4 waltz time by an eighty-five year old from Hull in 2009. At the end she moves into a second tune similar to the American recordings above. If “hayley payley snow” is a corruption of “early pearly snow”, that at least makes sense. There is also a discussion at The Mudcat Café which suggests the song was sung mainly in Yorkshire. I wonder how many of these orally-transmitted songs are now lost forever. My dad’s tune (below) differed only slightly from the Hull one. As the Garland Group web site observes, such variation is the nature of oral transmission.